From Italy to Dubai: It´s MailStore Showtime! 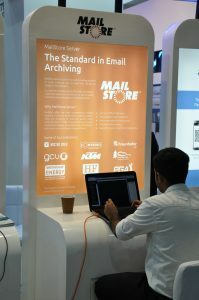 Two weeks ago, MailStore was getting a great deal of attention in both Italy and the United Arab Emirates – specifically, Dubai. At the five-day GITEX trade fair held in the latter location, the latest technologies and software solutions from a wide range of renowned vendors were put on display. Our distributor Bulwark was in the thick of it all with MailStore solutions on show. Meanwhile, our partner Achab had invited us to a two-day partner event, Aclub, held in Italy at the same time. Our sales colleagues and Managing Director Philip Weber made their way there, providing our distributor with enthusiastic support. Over 147,000 people visited this year’s GITEX event in Dubai, where they drew inspiration from the world’s leading technologies. The Middle East’s largest technology trade fair welcomed these visitors for the 37th time this year. Bulwark, our specialist for the Middle East region, made sure not to miss out on this year’s GITEX. 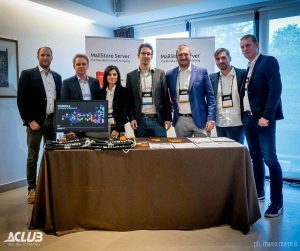 They presented our products, MailStore Server and the MailStore Service Provider Edition (SPE), on-site, setting up an impressive trade fair booth that invited visitors to come and stay a while. The professional Bulwark team left none of the visitors’ questions unanswered. MailStore has been successfully working together with Bulwark for five years now, and relies on the expertise our distributor has gained over the years. Meanwhile, our colleagues traveling to Italy enjoyed a gorgeous view of Lake Garda and informed our partner about email archiving. Achab invited more than 100 guests to the partner event. Norbert Neudeck, our Director of Sales, gave a lecture on the importance of email archiving, and briefly introduced our product range. The highlight was the introduction of the MailStore SPE to the Italian market. Luca Benaglio, Achab Sales Account Manager for MailStore, spoke in his native language about the advantages of the solution for managed service providers. Alongside interesting lectures and constructive discussions, magical entertainment topped off the event in the evening. Moreover, each guest who expressed interest in MailStore got the chance to go home a winner. The winners were drawn from a lottery at the end of the successful event. We are proud to have been part of such an incredible international event. Best of all, there’s no end in sight; currently the EBERTLANG MSP Roadshow passes through the cities of Munich, Vienna, Zurich, Berlin, and Wetzlar. As part of the tour, EBERTLANG is offering a great event for all interested parties all about the MailStore SPE. We are happy to see how much excitement the features in MailStore Version 10.2 have generated. Download a free, non-binding trial of MailStore Server and see them for yourself. Of course, the same applies for the MailStore SPE. Simply register as a service provider and download your free trial.